Id just spotted the story and pictures of the school, and have a picture myself, of when my sister & I went to Bradshaw. We lived close by at Moortop Garden Green Lane. I remember well making a huge black carriage for the centenary year out of cardboard and, dressing up ....as you will see by the picture! 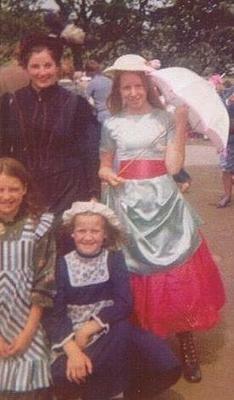 Mrs Mitchell the teacher on the left.W Wilkinson, Myself and my sister Hayley & Lyndsay Pickles respectively. Sports day on the field and, on hindsight we were lucky we had a field to play on! I got a cardboard bronze medal with a red ribbon, for throwing a ball to the top of the field, ok...quite a way up! heehee. Great days, flown by! Join in and write your own page! It's easy to do. How? Simply click here to return to Old Halifax Pics.